Street vendors in NewYork city become a major part of the city’s culture. Most of the produce vendors are immigrants making a living in a big city. In order to set up a stand, the vendors are expected to go through a permit process and it is hard work in order to maintain a stand. The project is an intervention of the produce vendors in the city through various research methodologies. Produce vendors in NYC must work hard in order to maintain the produce stand. They must go through a strict process in order to obtain the permits for their cart. The city’s policies are unclear or strict and the vendors must go through a huge process in order to retain their business. The policies are unclear and hence, the vendors are unaware of all the laws, they get fined for not following the health codes. 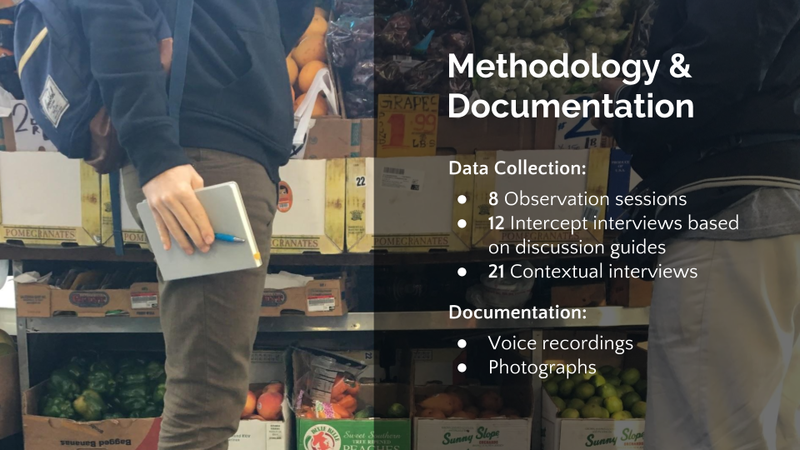 Intensive analysis revealed new understandings of the primary challenges faced by New York’s street produce vendors. Once we began to understand who the vendors were and their true identity, some of the challenges they face began to emerge. The challenges were– the permitting process, regulations and enforcement. Each of these challenges helped test our assumptions and gave new information, further breaking the newly obtained information into implications. Through implications we arrived at certain recommendations. If the above recommendations are taken into consideration and the policies and processes are renovated, vendors can then thrive in New York city with more entrepreneurial opportunities and scaling to other parts of New York city– including food deserts that can further enhance healthy eating communities.